Elegant and refined, our hanging brackets can be used indoors or outdoors. They are the perfect way to display our hanging baskets, lanterns, or hanging wall ornaments. 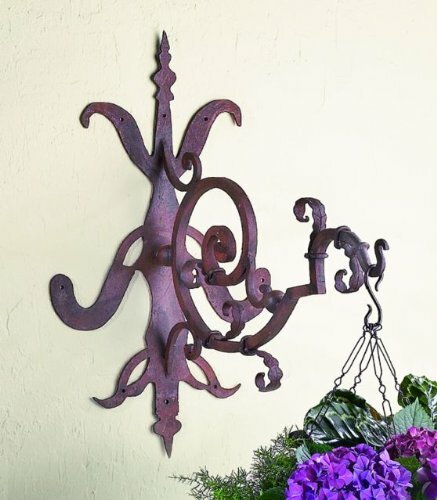 Handcrafted iron with antiqued rusted brown finish. Will develop a natural patina when exposed to the elements. Sturdy enough to hang heavy items. Great with any of our lanterns or hanging baskets. Has holes for mounting screws (not included). Matching chain/hanging basket shown sold separately. Condition: Brand New - First Quality • Heirloom Quality - Expertly hand crafted and hand finished • Due to the hand crafted nature of this piece, each piece may have subtle differences. If you have any questions about this product by Intelligent Design, contact us by completing and submitting the form below. If you are looking for a specif part number, please include it with your message.